The integration will allow you to quickly and easily bring in account and investment holdings into TOTAL Online from Junxure (desktop). To get a head start on using this integration to streamline your planning process, follow the four steps below. Review the User Guide. This includes instructions to setup the integration and what to expect from the process. Install the Money Tree to Junxure export tool. Use the integration following the steps in the User Guide. Report any issues to support@moneytree.com. Please feel free to report successful imports or any other feedback. Questions? Call 877-421-9815 ext 0 for support. 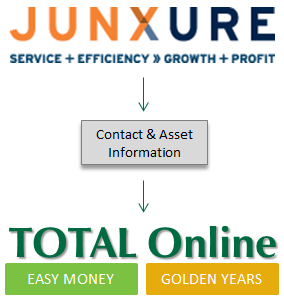 Money Tree Software’s TOTAL Online is now integrated with Junxure’s comprehensive practice management system. This integration allows you to access Junxure client data in TOTAL Online to streamline your process for creating financial plans. View the TOTAL Online with Junxure® guide to walk through the steps of accessing Junxure's information using Money Tree's TOTAL Online. >> Install the TOTAL Online Junxure Exporter tool to use this integration. Streamline Your Planning Process Today with TOTAL Online's Integration with Junxure.